TrueCrypt shutdown? Where’s my tinfoil hat! This is bad. Very bad. And strange. And very, very, bad. Wait, whut? 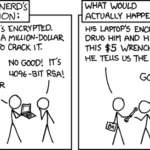 TrueCrypt has apparently shutdown, called itself insecure, and advised everyone to switch to BitLocker. You should read the comments on those articles folks, people waaaaay smarter than me are talking.